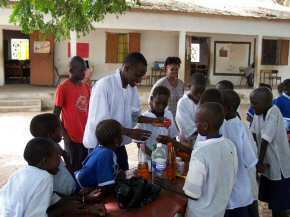 Back in March, we brought you news about the Collyer's College, Horsham initiative to promote science in The Gambia. 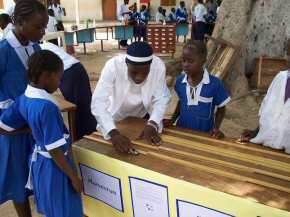 Pageant members took out a number of copies of a specially written teacher's manual, 'Basic Science for Gambian Schools', and some teaching resource kits. 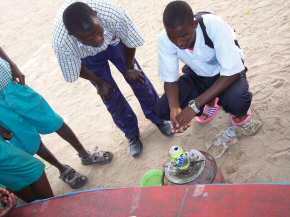 There were two Science Kits, one going to Gambia SSS in Banjul and the other to Essau SSS on the north bank of the river. 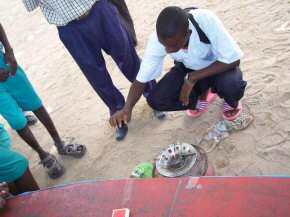 There was also an Electronics Kit, which went to the Electronics Department of the Gambia Technical Training Institute (GTTI). 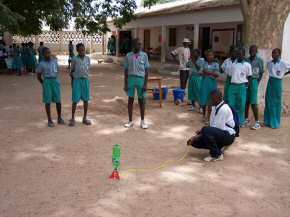 There are further details about the Science Initiative and the use of the Science Kit at Gambia SSS on a previous news page. "I just wanted to write and let you know we received the package of science materials from Collyer's. It is AMAZING!!! Last week I took my kids to St. Michael (a Basic Cycle school in Njongon), and we had a miniature science fair with the materials that were donated and some things we scrounged from around here. My kids loved it, St. Michael's kids loved it, and I think a good number of grade 9 students are much more sanguine now than they were two weeks ago about the possibility of taking science next year. I took some pictures of the fair, and I'll be sure to send them on to you as soon as I get them on our office computers. The water rocket and solar buggy have also made rounds to other schools in the area, and every time they're met with equal enthusiasm. Thank you very much for all the assistance you and your organisation are providing. We really appreciate it!!!"